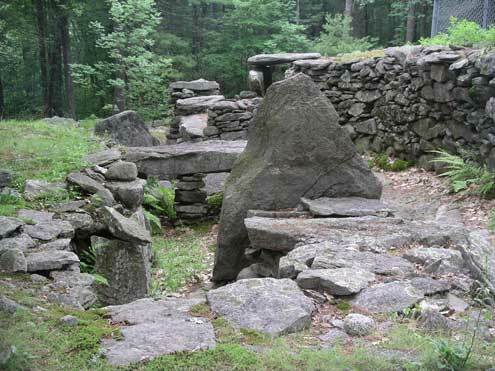 Located at 105 Haverhill Road, North Salem, New Hampshire, America’s Stonehenge is the former Jonathan Pattee farm atop Mystery Hill. Before the Pattee family settled here in 1734, there is evidence that native people lived nearby. But the most interesting inhabitants of this area may have been an unknown megalithic society that constructed a 12 acre astronomical stone calendar and a complex of underground chambers. Mystery Hill is open year round, even winter, when snow shoe trails are open and snowshoe rentals are available at the gift shop. The annual “Blow Out Snowshoe Sale” started in February for those looking for bargain used showshoes. But later in the season, when the snow melts, it is easier to view the stone structures, natural and manmade, that make Mystery Hill a tourist destination. The best way to visit is to take in the ten minute video presentation at the visitor center, and then use a map to take in the one hour self guided tour of the astronomical site. Bring a pair of binoculars if you are there for an astronomical event such as Summer Solstice or Spring Equinox. There are easy directions on the maps for lining yourself up with the giant stone megaliths to view sunrise or sunset. On March 20th the Spring Equinox occurs, and the stone calendar is open from sunrise to sunset for viewing this phenomenon. No one knows who built the stone chambers and megalithic calendar, but after viewing the museum, video and Mystery Hill, you will have fun discussing the possibilities with your companions. It is especially fun to have children come up with possible theories for the artifacts found at America’s Stonehenge. 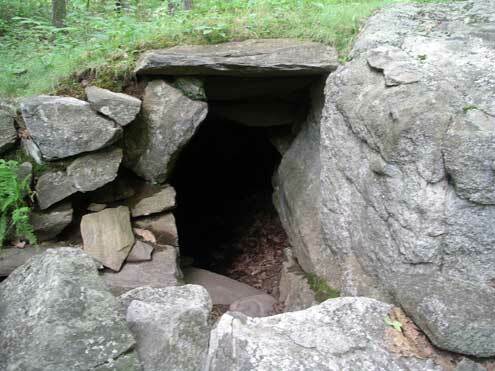 Did you know that there are over 350 megalithic sites in New England? I have visited several in my travels, including the stone chamber in Burlington, Mass, the Tower in Newport, Rhode Island, and the so called “Westford Knight” carving found in nearby Westford, Massachusetts. Some look like megalithic sites in England or Spain, and there are also subtle differences. Each visit brings up more questions than answers! Admission is $10.00 for adults, $9.00 for seniors ages 65 and up, $7.00 for children 6-12 years old, and children 5 and under may enter for free. Memberships are also available for individuals or families (useful if you wish to view several equinoxes or solstices in one year!) Go to the website www.stonehengeusa.com for money saving admission coupons and bookshop coupons. The website also has a schedule of special events (including astronomical events), driving directions, and other information. This story was originally written for Londonderry News by Heather Rojo. For detailed directions to America’s Stonehenge, review this map!